Sinica Podcast held a discussion about Taiwan from their personal experiences. The discussion explores Taiwanese's personal identity, their culture, media situation, health care system, as well as Taiwan's political relations with the mainland. The Economic Cooperation Framework Agreement (ECFA) between Taiwan and China was signed in June 2010, followed by the Bilateral Investment Agreement signed in August 2012. The latest Service Trade Agreement was signed in June 2013. According to an online survey conducted by a civic group, Big Citizens Is Watching You, among the 61.6 percent of the 2,259 respondents who have some knowledge about the Service Trade Agreement, more than 97.5 percent do not support it, 38.1 percent of the respondents have no knowledge of this agreement, 0.3 percent do not have an opinion, and only 1.6 percent who know about it support it. Taiwan Music Writing Group, a collective blog for music commentary, has published a roundup of the music scene in Taiwan in 2013. I have collected and inserted 12 the music videos introduced in the blogpost from Youtube so that GV readers can actually listen to the songs and their presentation. The Village Armed Youth, an activist music band in Taiwan social movement, has suppressed their anger. In their new album, “Where is happiness?”, the songs are full of anxiety. What is our future? The future is like a flowing river, and you can't see its end. Apart from rock bands, hip-hop circles are full of excitement. Rappers tell stories about society from another angle. 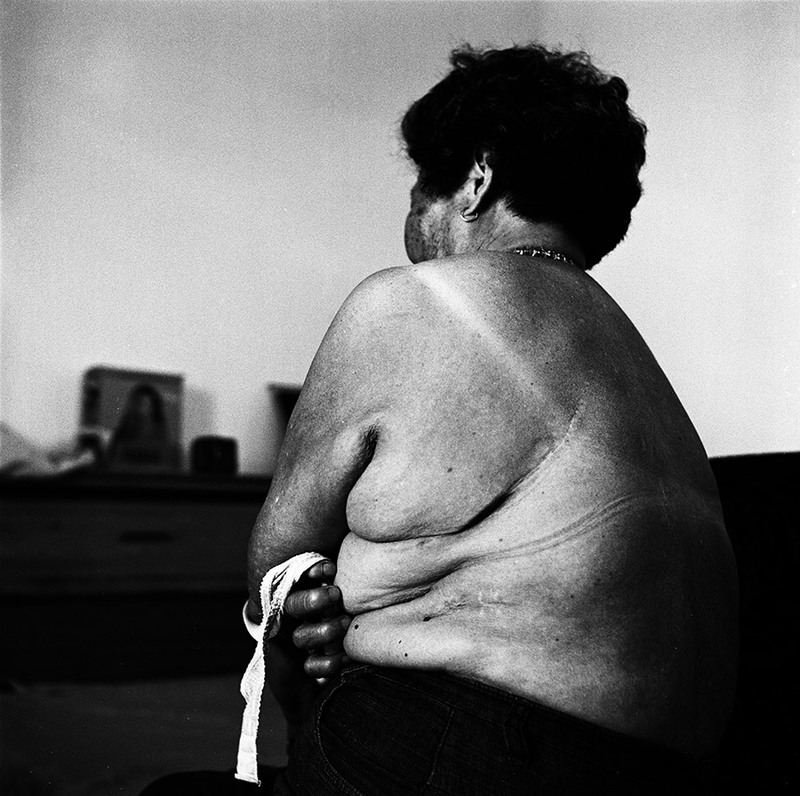 [...] Softlipa’s “Enemy's Kids” depicts broken families from both the lower class and the middle class. Such tragedies kept happening in the city. His other song, “The Unknown Renovation Inside Du Jen-Shi” sounds foggy, like a man talking to himself in a rented apartment in rainy Taipei city. Ming-Yu Hsieh's new album “Tainan” has made a killing of awards. You won't hear the stereotypical impression [of Tainan], like the delicious food, tourists, and cafes of Taiwan, but you will hear about things like the time-honored old city gate, old friends, old stories and old memories. Like a nostalgic middle-aged man, planting his feet in the solid ground, singing and praying on the soil of Tainan, where the sky is covered by the flame trees’ red flowers. While the seniors returned to the stage, new faces could not wait to show up. They do not constrain themselves to the conventional four major music instruments, and their music genre is not limited to folk, shoegaze, post-rock, or post-punk. They are more willing to combine digital acoustics in their music [...] Sonic Deadhorse has been hidden underground for a long time. They finally issued their new album. The edgy audio-visual performance has very good reviews from music critics. Residents in the area of a petrochemical processing plant in Taiwan's western Yulin County are at risk for exposure to several toxic air pollutants that can cause various diseases, including cancers, according to a report by researchers from the National Taiwan University. The comprehensive research on the impact of Formosa Plastics Group's naphtha cracker No. 6, released in July 2012, found that among the pollutants that residents are likely to be exposed to the carcinogenic and liver-damaging vinyl chloride, which is an essential raw material in the manufacturing of PVC and other plastic products. The findings echo those of the US Environmental Protection Agency, which saw “extensive” violations at Formosa Plastics' plants in Louisiana and Texas in 2009. The Taiwanese company paid a settlement worth 13 million US dollars in that case to the US Department of Justice. The Yulin Country naphtha cracker was met with public opposition over its possible health consequences from the start of construction in 1992. In 2009, the local government, which had welcomed the investment in their area, agreed to invite researchers from the National Taiwan University to conduct a three-year study to evaluate the health risk in relation to the complex. Tsai-Neng Chen, who lives in Taishi, told me that his parents and sister and brother and son died because of liver cirrhosis. His son was only 19 years old when he died. Tsai-Neng Chen himself also has suffered liver cirrhosis for five years […] “Some people said that I ‘imagine’ the correlation. However, if this disease is due to genetic problems from my father, why are my three sisters who moved out after they got married still healthy and fit? Only us who stayed here get sick and die.” Tsai-Neng Chen emphasized the threat faced by all the residents of the area by the Naphtha Cracker Complex […] If the residents care about their future generations and decide to file a lawsuit against Formosa Plastic Group, he will be the first one to join. The study has also prompted other nearby areas like Chuanhua County to push for a similar investigation into their situation. 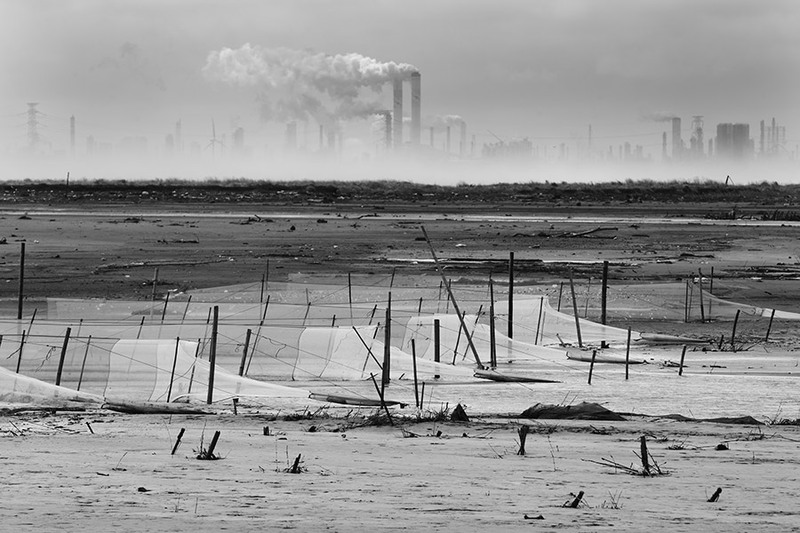 Chuanhua County is located north of the plant, and when the summer south wind blows, residents fear that it might carry some of the same air pollutants with it. Sheng-Hsiung Jung, reporting for PNN, visited the affected villages from Chuanhua County and presented a photo feature titled as “The South Wind”. GV has granted the permission from Jung to republish and translate part of his feature report at PNN. In the past, everyone in the village would jump into the sea to catch eels. Old fishermen would tell you, in the old days, the river mouth would be crowded with people like a night market as villagers would catch grass eels to increase the family income. 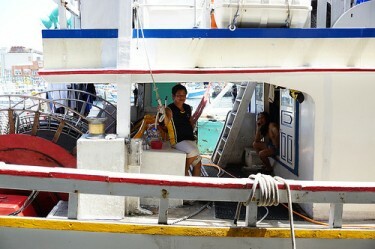 However, the good old days didn't last long and now you seldom see people fishing for grass eels. The eels are vanishing at rapid speed. 61-year-old Chin-Feng Chen's late husband, Shih-Hsien Hsu, who died two years ago, did not leave her anything except an old house, for which they have paid the mortgage for 20 years but still need to pay more. And the debt for his sickness is yet to clear. 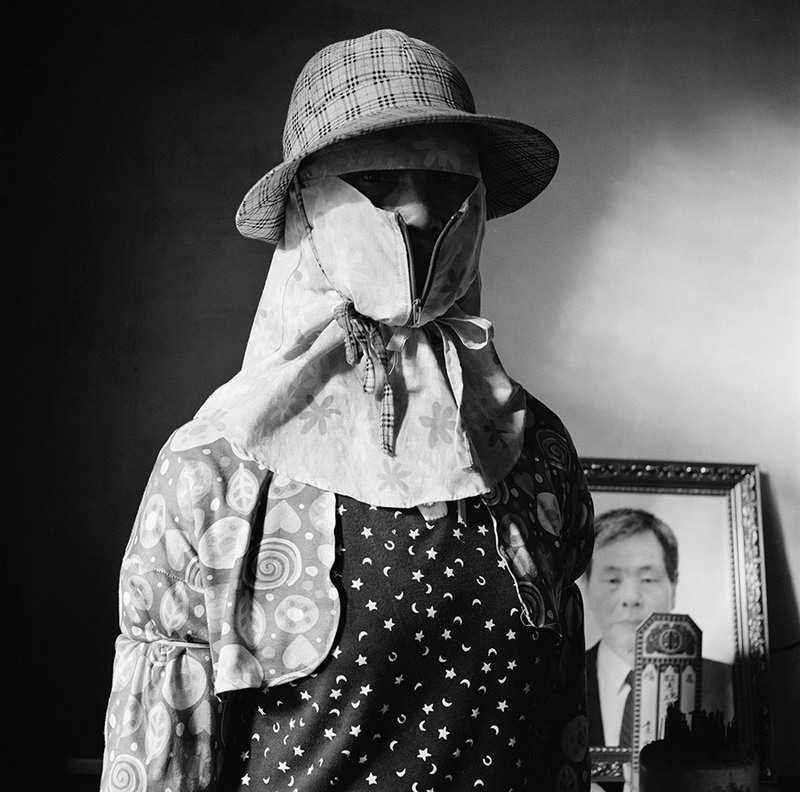 When Shih-Hsien Hsu was alive, they always did the farming together. Since they did not own any land, they could only farm for others to make an income. Their financial condition was never good. In 2006, Shih-Hsien Hsu, who never smoked tobacco nor drank alcohol or chewed betel nuts, was diagnosed with oral cancer. His health condition kept deteriorating despite help from doctors. He died in November 2011 at the age of 59 after the cancer spread to his lungs. Chin-Feng Chen said that she does not have sufficient knowledge to explain why her husband died from oral cancer. However, she wonders how a person such as her husband, who was a farmer in the countryside without any bad habits such as smoking and drinking or chewing betel nuts, died from oral cancer. 74-year-old Lin-Shin Wei developed a six-centimeter-large tumor in her left lung three years ago, and was diagnosed with lung adenocarcinoma. Considering her age and the size of the tumor, the doctor suggested that the cancer not be removed through surgical measures because her prognosis might not be very good. However, Lin-Shin Wei said she wanted to fight the cancer and proved her body strong enough to receive the surgery. She eventually convinced the doctor. Now Lin-Shin Wei has a scar 15 centimeters long on her body. She was proud to show the scar to me during the interview. To her, this scar is not only evidence of her illness, but also an award for her will to live. The statue of the Blessed Virgin Mary with facial tattoo based on the Atayal people's tradition. Photo taken by Octopus (章魚). Non-commercial use. 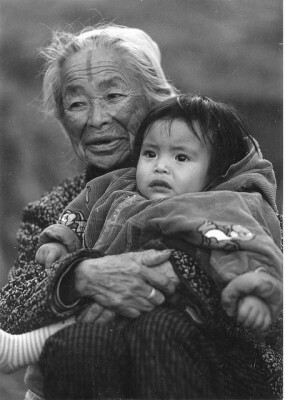 An Atayal woman with the traditional facial tattoo held her granddaughter. Photo taken by atonny.Non-commercial use. When Italian Catholic Father Alberto Papa came to Taiwan in 1963, he learned that face tattoo is an important culture for many aboriginal tribes in Taiwan. For example, in Atayal culture, only respectable person would have face tattoo. 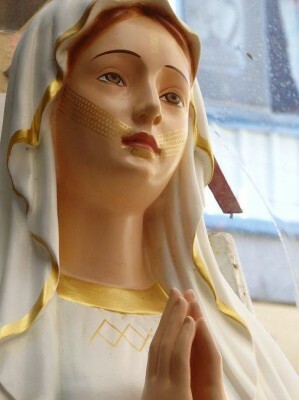 To deliver the idea that Virgin Mary is a holy figure, the father decided to add a golden face tattoo on the statue of Virgin Mary in his church. More photos showing Taiwan aboriginal women with face tattoo can be found here. Kevin Tang from Hong Wrong translated a series of comics depicting the differences between Hong Kong and Taiwan by a Hong Kong-based Taiwanese artist JIEJIEHK. Below is one of the comparison that vividly shows the difference between the restaurant services in Hong Kong and Taiwan. 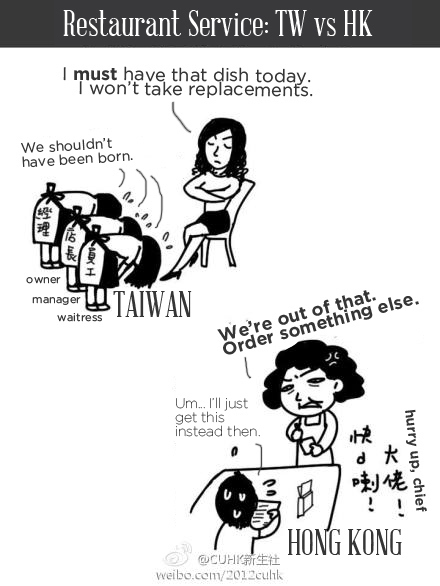 Restaurant service in Taiwan and Hong Kong by JieJieHK via Hong Wrong. Protesters occupied the famous landmark at the Freedom Square. 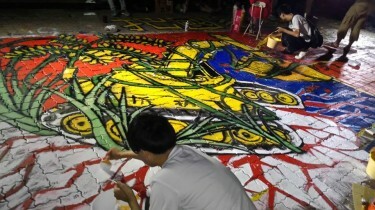 Photo taken by 鐘聖雄, PTS News Network. Non-commercial use. More than 50,000 protesters are demonstrating outside the President Office in this year's National Day of Republic of China on October 10 in Taiwan. They were demonstrating against the 4th nuclear plant [zh], the protest [zh] against the present referendum law and against the top government officials, including the president, vice president and prime minister for the controversial service trade agreement with China and the recent wiretap scandal. Protesters, barricades and the policemen outside the President Office. Photo taken by Island Nation Youth. Non-commercial use. A group of 300 individuals in Hong Kong published a statement in Taiwanese newspapers warning the Taiwan society against Sinicisation [i.e. the bad influence of mainland China]. The statement has two versions one published in Hong Kong and one in Taiwan. Dictionary of Politically Incorrect Hong Kong Cantonese has translated the Taiwanese version. The Korean Council for the Women Drafted for Military Sexual Slavery by Japan has launched a new campaign to gather 100 million signatures. Their online petition, in eight different languages, calls on Japanese government to offer an official apology and legal reparations to the victims and asks the international community to join their cause. Over 743 thousands have already joined online. Protesters’ painting inside the Ministry of Interior. Photo taken by Val Chou. More than twenty thousand people occupied the entrance of the president office on August 18, 2013 against the Land Expropriation Act and forced expropriation. Later at night, five thousand protester entered the Ministry of the Interior and started their sit-in protest [zh]. Their painted inside the building on the struggle between paddy and excavator. The first online dictionary of the native language used by the aboriginal peoples [zh] in Taiwan had its debut on August 5, 2013. The first stage of this online dictionary includes the native language of the the Bunun people, the Tao people, the Truku people, the Saisiyat people, the Thao people, and the Tsou people. This dictionary is planned to includes 16 languages in the future. 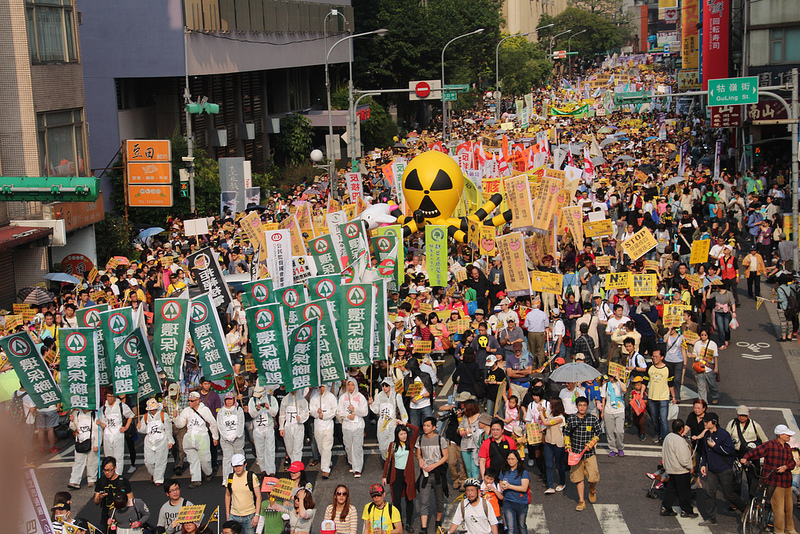 Taiwan Anti-Nuclear Action Coalition (台灣反核行動聯盟) - the page is for organizational networking. 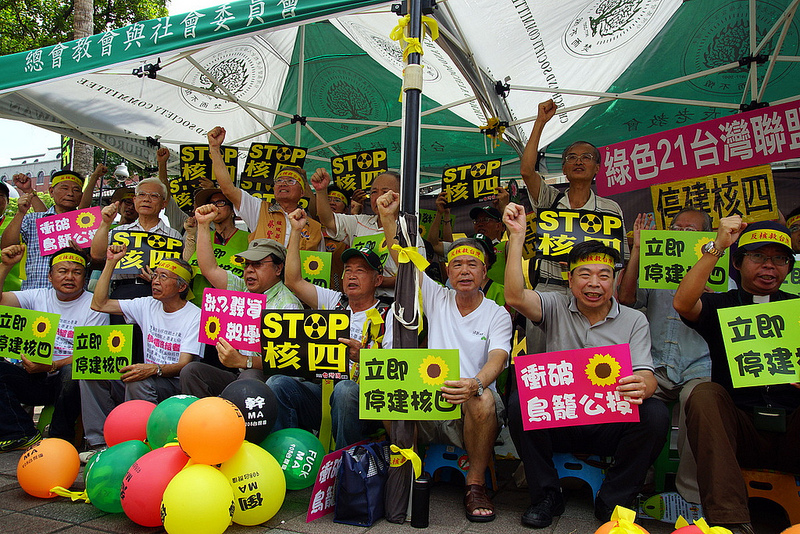 2013 Stop Nukes Now (2013廢核大遊行) - a page for recording and coordinating anti-nuclear protest. 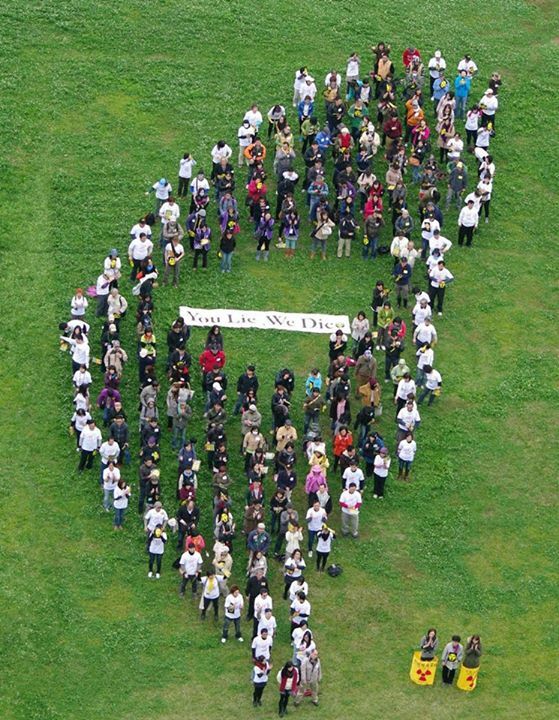 Anti-Nuclear Out of Love (為了親愛的你，我反核) - the page collects personal photos that express love and anti-nuclear messages. Coalition of Mothers for the Monitoring of Nuclear Plants (媽媽監督核電廠聯盟) - a page to recruit mothers active against nuclear. 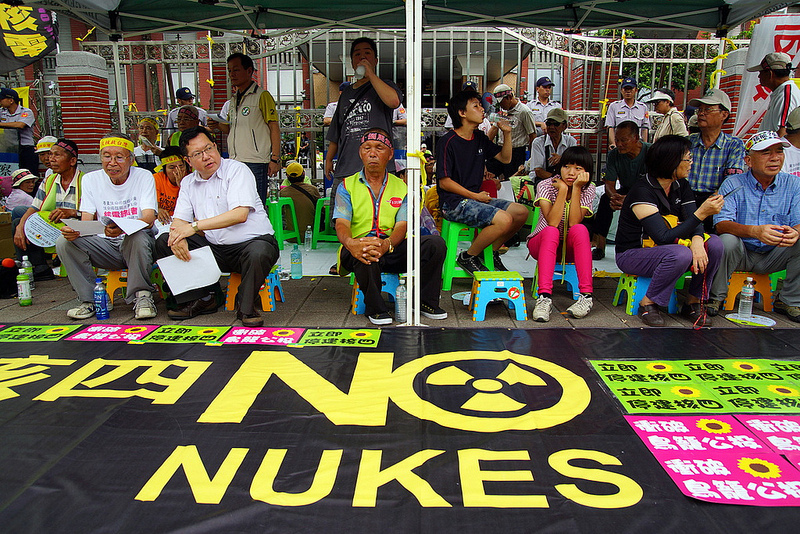 Coalition to Determinate the Fourth Nuclear Plant with a Vote (終結核四催票大聯盟) - a page to mobilize Taiwanese to vote in the referendum against the fourth nuclear plant. Lawmakers exchanged punches in Taiwan's parliament on August 2, 2013 ahead of a vote on whether or not to hold a referendum on the island's controversial fourth nuclear plant. The plant, which has been under construction for more than a decade, is a divisive issue for Taiwan and has been met with large-scale protests because of safety concerns. The next round of debate regarding the referendum controversy [zh] will take place on August 6, 2013. Legislators from the Democratic Progressive Party (DPP) will continue to try to delay the vote, while ruling party Kuomingtang wants to pass the referendum by end of August. The question of letting the people vote on the plant's fate has thrust Taiwan's tough referendum requirements into the spotlight. Lawmakers from the DPP oppose a referendum, calling the mechanism unfair. 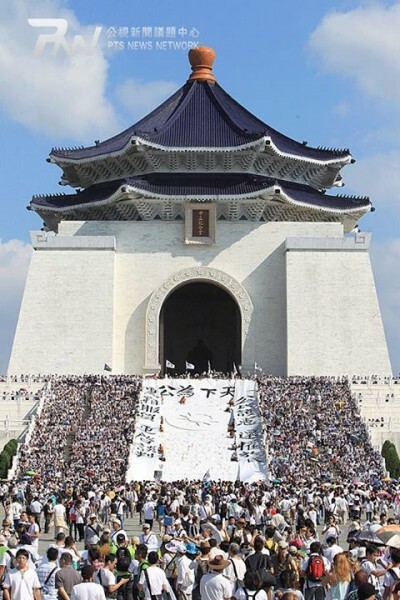 The Referendum Act in Taiwan, which was was passed [zh] in November 2003, requires 50 percent of voters to participate in the referendum or else the proposal in the referendum will be rejected. In the last ten years, six national referendums have been proposed, but none of them was passed. As the act requires a referendum to meet the participation threshold of half of the electorate, even if the majority of the voters reach a consensus, the referendum will become invalid. Since the voting rate in Taiwan is about 75 percent, the mobilization of 30 percent of voters to boycott the referendum will override a consensus reached by a majority of the voters. 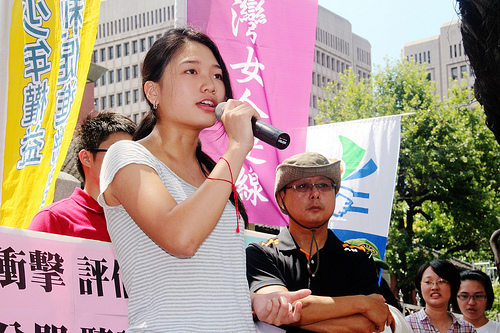 Protesters demonstrated outside the Legislative Yuan against the fourth nuclear plant and the referendum. Photo taken by 陳逸婷, coolloud.org. Non-commercial use. For example, in 2004 two referendums [zh] did not pass even though more than 90 percent of the voters had reached a consensus. The first one was on whether Taiwan should acquire more advanced anti-missile weapons if mainland China refuses to withdraw the missiles it has targeted on Taiwan. 45.17 percent of the electorate went to vote, and 91.8 percent of them voted yes. The second referendum was on whether the Taiwanese government should engage in negotiations with China on President Chen’s proposed “peace and stability” framework for cross-strait interactions. 45.12 percent of the electorate went to vote, and 92.05 percent of them voted no. Both of them failed to pass. In short, passing a referendum is more difficult than winning a presidential election in Taiwan. Kuomintang [the dominant party in the Legislation Yuan], which is used to autocracy, wanted to suppress people's power through highly unreasonable and strict rules when they put forward the Referendum Act in 2003. It is almost impossible for citizen to initiate and pass a referendum according to the Act. In the past ten years, only the president and the two major parties, Kuomingtang and the Democratic Progressive Party, are able to propose a referendum, and none of them passed. We are convinced that this Referendum Act is designed to avoid referendum. If we have a referendum based on the current Referendum Act, it would either become a political game played by the politicians or turn into a joke that turns citizens into fools. That's why after the current Referendum Act was passed, the organization I joined for advocating the Fourth Nuclear Power Plant Referendum did not talk about referendum anymore. Instead, we ask to amend the Referendum Act. If the Referendum Act is not amended, the referendum itself does not make any sense. As a result of the unreasonably high threshold for passing a referendum, the advocates of a referendum prefer the wording of the question to be against their own position. For example, considering the dispute of the fourth nuclear power plant, the government and the ruling party prefer the question to be set as, “Do you want to stop the construction of the fourth nuclear power plant?” On the other hand, the opposition party prefers the referendum question to be set as, “Do you want to continue the construction of the fourth nuclear power plant?”. The wordplay in referendum questions is not favorable to the opposition party because the government-appointed referendum committee holds the power to reject a referendum before it goes to the voting process. For example, a referendum was proposed in 2009 regarding the Economic Cooperation Framework Agreement. 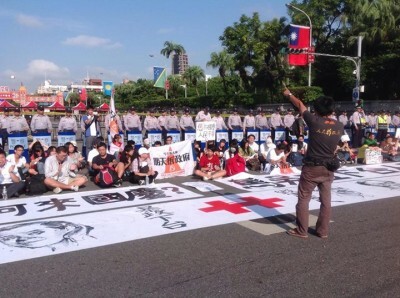 The referendum was initiated by a joint-signature of more than 109,000 Taiwanese [zh] but eventually rejected by the referendum committee because the wording of the referendum question was against the referendum proposer’s stand. After the referendum proposer made an appeal to the Supreme Court, the Supreme Court ruled that the rejection issued by the referendum committee is not consistent with any requirements stated in the Referendum Act in 2012. For these kind of major policies like the Nuclear Power Plant 4, once it is initiated, regardless of its result, we cannot propose the same referendum in the future for eight years.This restriction has its positive function to keep a stable consensus for the policy if we have sufficient voters [i.e., more than half of the electorate]. 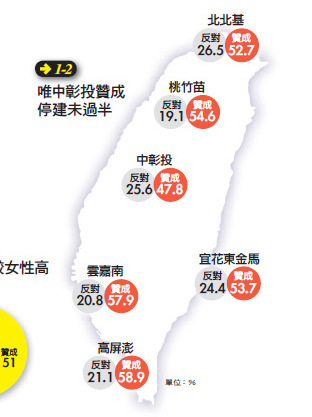 Nevertheless, if there are only very few people coming to vote […] , the result of a minority will restrict all Taiwanese from putting forward the same referendum again. This is unreasonable. We need to amend the Act to solve this problem! (Or we should have a referendum for a new Referendum Act!). 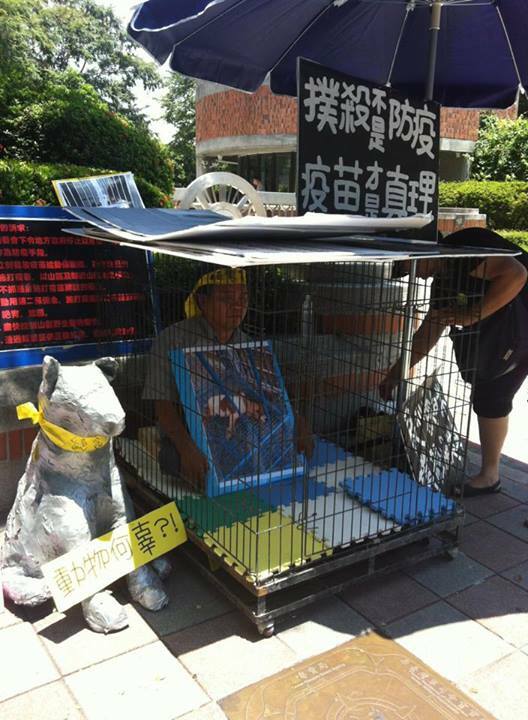 An animal right activist locked himself in an animal cage outside Council of Agriculture against the killing of stray dogs and cats to prevent the spread of rabies. He advocates for vaccination. Photo from 張敬偉 Facebook. “The Far Eastern Sweet Potatoes” has written a review and analysis of the development of student movement in Taiwan in reaction to issues such as media monopoly and land justice against the background of cross-strait relation. The dispute over land expropriation in Miaoli County has lit a fire for a series of flash protests targeting the President and the Premier for their indifference to citizens’ suffering. Several policemen from a “special district branch” were reported to check protesters’ I.D. and take away those who refused to show their I.D. to the police stations. More from The Far-Eastern Sweet Potato. A professor in Taiwan along with a number of student protesters were arrested [zh] during a demonstration against the forced demolition of homes to expand Jhunan Science Park in Miaoli County, Taiwan. 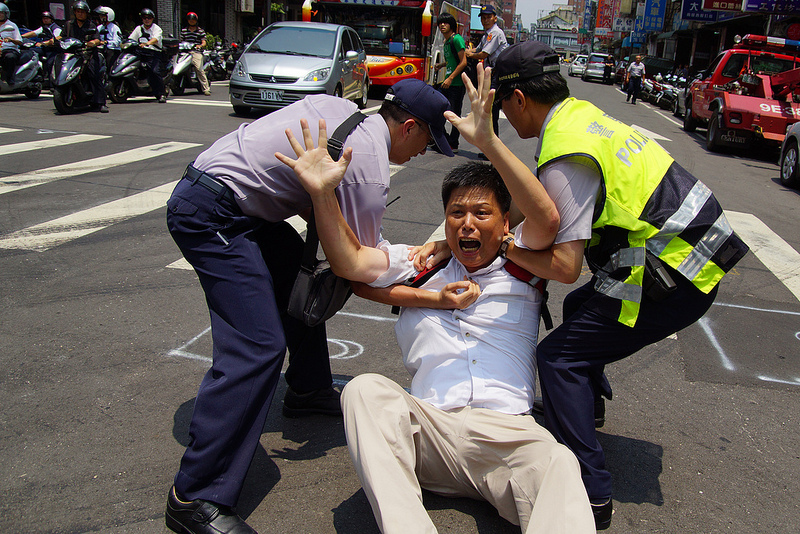 Hsu Shih-Jung (徐世榮), a professor of the Department of Land Economics at National Chengchi University, was yelling a protest slogan, “Today you demolish Taipu, tomorrow we demolish the government”, when Taipei police officers arrested [zh] him on July 23, 2013. He was transferred to the local police station and indicted [zh] on the charge of endangering the public. Hsu was released on the next day and the charge against him dropped as the jury did not agree with the police's accusation. Hsu was one of the attendees in a negotiation meeting between protesters against expropriation of rice fields in Jhunan and the Executive Yuan represented by the then Prime Minister of Taiwan Wu Den-yih in August 2010 after a 72-year-old woman committed suicide in protest. In that meeting, an agreement was made that four houses own by four different families located at the margin of the science park would be preserved. However, endorsed by Wu Den-yih, who is now the current vice president of Taiwan, the Miaoli County government ordered these four families to move before July 5, 2013 for demolition. 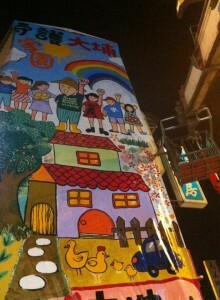 Protestors painted a huge mural on the wall of Chang's house. Photo taken by Taiwan Rural Front from. Outraged by the Miaoli government's violation of the agreement, protesters had gathered together around the four houses to defend them against expropriation for more than two weeks. Chang who is a Pharmacy is one of the four families who resist moving. Their house is located at the junction of Justice Road and Love Road and hence become a symbolic site for the protest. 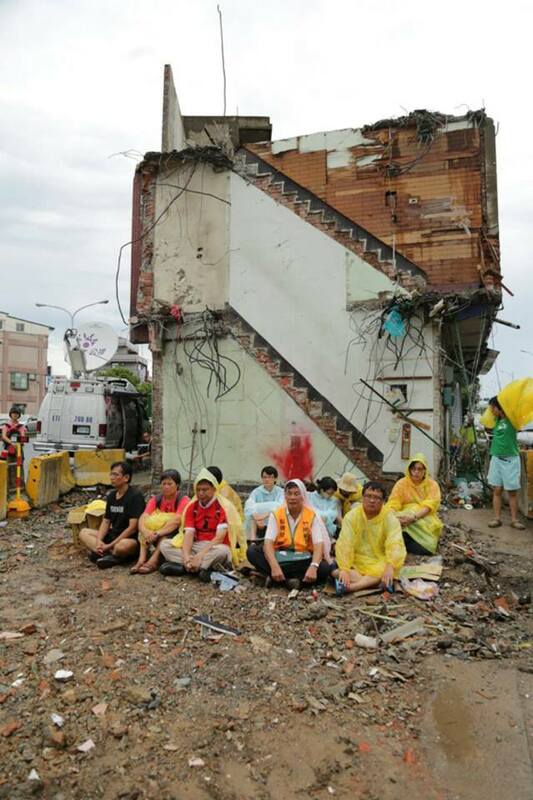 On July 18, while most protesters went to Taipei to protest in front of the president's Office, Miaoli County Commissioner Liu Cheng-Hung, ordered police to expel the rest of protesters who were gathering in front of the homes ordered several excavators to tear the houses down. Even though the houses were destroyed, protesters refused to leave and kept on demonstrating. People depend on their land for building their family and house, such rights cannot be infringed. Such rights can only be exploited when the decision is in alignment with Amendment 23 in the Constitution: “The enhancement of public interest”. What is public interest? The Grand Judge, Wu Keng-Chien, pointed out […] “A consensus through public deliberation in a diverse society” is public interest. However, our urban planning system has not incorporated such concept or process. Thus our basic human right has been seriously violated. In Taiwan, the definition of public interest in urban planning is dominated by a group of minority political elites in urban planning committee, local planning committee, and land levying committee. This is a residue of the authoritative era. In these committees, half of their members are from the administrative unit and related government organizations. […] In fact, most of the committee members are from the government. The leading cadre does not avoid conflict of interest. Moreover, the leading cadre always forces these projects to be passed. As a result, the so-called ‘public interest’ is controlled by a handful number of people. Sit-in protest after the house was torn down. 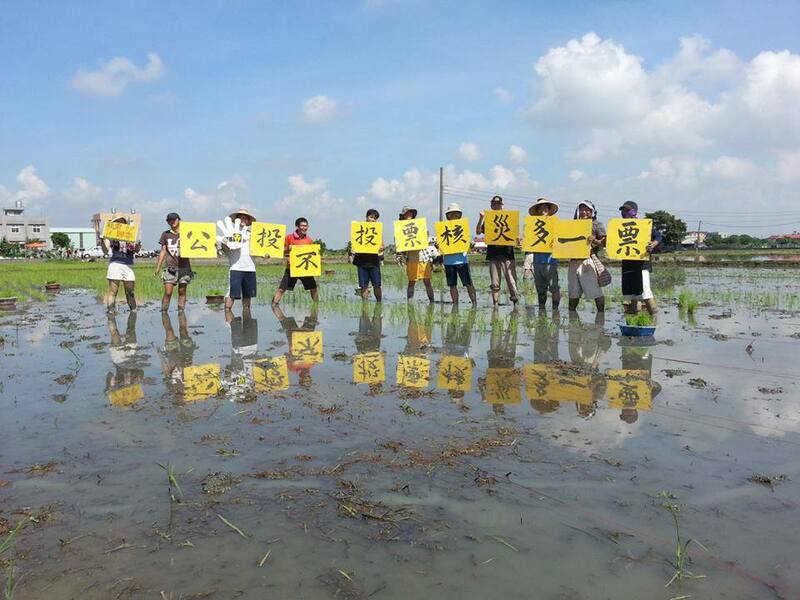 Photo taken by Taiwan Rural Front. In fact, independent reporter AboutFish from citizen media outlet Taiwan Good Life pointed out that the decision to expand the Science Park has led to an increase of local government debt. Members of Miaoli community do not benefit from the project, on the contrary, each resident has to shoulder 73,000 new Taiwan dollars (approximately 2,320 US dollars) government debt. The public debt in Miaoli has reached 41 billion new Taiwan dollars (1.29 billion US dollars) and potential debt to emerge is 10.3 billion new Taiwan dollars (33.5 million US dollars). How can the government earn the money they need when they face a budget deficit? The government does not dare to get money from those wealthy and powerful people. Instead, the government provides these people exemption and preferential. On the other hand, the government intrudes in the lives of the disadvantaged minority and takes their land away without their agreement. Through sectional land acquisition, the local government can obtain one-third of the land they want. They can sell the acquired land to make up for the budget deficit. In addition, the local interest groups usually make money by investing the real estate. By expropriating the land section by section, the local governor can build up a strong relationship with the local interest groups and make sure they can win their political support in return. Protesters continue to demonstrate, asking the government to return the expropriated land, investigate these scandals, and revise the related law. Professor Hsu was yelling: Today you demolished Taipu, Tomorrow we demolish the government, when the police dragged him away. Photo taken by 陳韋綸 from coolloud.org. Non-commercial use. 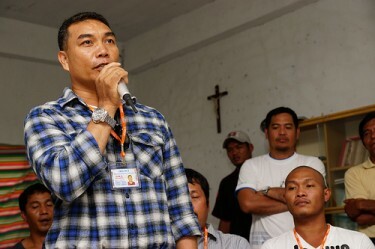 Eighty-nine Philippine fishermen in Taiwan's Yilan County have formed the island's first migrant workers’ union, three years after an amendment to the Labor Union Act was passed giving migrant workers the right to organize their own labor unions. 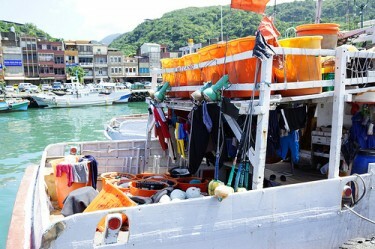 The fishermen union was formed on May 25, 2013, but represents only a fraction of the migrant fishermen legally hired in Taiwain — currently, there are more than 6,000 [zh]. Among them, Indonesians are the majority, and the rest are mainly from Vietnam and the Philippines. The majority haven't been unionized and face serious exploitation from employers. Because the members of this union are mainly from the Ilonggo Seafarers Organization, most of its members are from the Philippines. However, Jose emphasized that they want to expand the size of the union. In the future, they want to serve the Indonesian fishermen as well as the Philippine fishermen…Several migrant worker associations from Kaoksiung and Pingtung, which are also famous for their fishery industry, came to their meeting to learn how to form a migrant workers’ union. Image from Roger Pielke Jr.'s Blog. The Taiwan Intellectual Property Office (IPO) [zh] recently proposed [zh] to amend the Copyright Act and provide legal justification of IP and DNS blocking at the Internet Service Provider (ISP) level through a black list system. The government claims that the amendment would stop the illegal sharing of movies and music protected by copyright law. Although IPO has stressed that the Internet service providers will only block overseas online platforms which are “specifically designed for copyright infringement activities” or websites which have “obviously violated copyrights,” such as Megaupload, the authorities will target online platforms that enhance peer-to-peer transmission including Bit Torrent, Foxy, and FTP sharing. 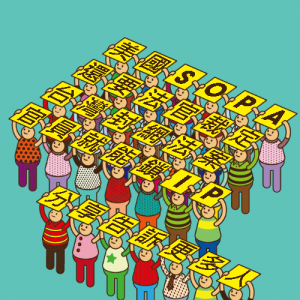 The Taiwanese government proposal is similar to the United States bill, Stop Online Piracy Act (SOPA), which was suspended last year following criticism from companies and civil society groups asserting that the legislation would threaten online freedom of expression and information flow. If the Taiwanese copyright amendment is implemented, the Island will have a mechanism that blocks and filters away “illegal websites” that host material that infringes copyright laws. This could be detrimental to sites like YouTube, where users regularly upload videos that may violate copyright laws. Although the company has a system for removing these videos, a law like this could lead to the site being blocked altogether. Q: Do you want to see pirated movies? A: No, I never watch pirated movies and I go to the cinema at least twice a month to see movies. I want to defend a principle. If today the government finds a reason to get around legal procedures for blocking foreign websites, some day, it could block Thinking Taiwan [a blog hosting platform] (hosted by Acquia) because it has threatened national security, or block fish.123 [an online shopping platform for fish lovers] (hosted by Amazon) because it has affected our conventional market order; or block Mr. Jamie [a platform for start-ups] (hosted by Media Temple) because it has misled our young people's attitude in their career development. No matter if you are the operator of a platform or commercial business, you will be exposed to the threat of being blocked. The knife of the IPO is against your throat. Can you accept that? Can you accept the blocking of Facebook (hosted by Facebook) because there are too many infringed movies or the blocking of Dropbox (hosted by dropbox) because it is frequently used for the transmission of illegal software? This is not a copyright infringement issue, it is an issue of the violation of people's rights. 但是, 封網站就是不對, 就是開民主倒車, 勞民傷財的豬頭政策. 有執行封網站政策的國家聯上的是Intranet, 而不是Internet. 封網站是現代國家邁入鎖國的第一步. 智財局若想以行政命令的方式, 用”管好ISP業者就能防堵侵權內容散佈”的思維, 無非是自亂陣腳, 落入了開民主倒車的困境中. […] 要求ISP以黑名單的方式封堵網站, 短期間可能有效, 長期下來必定會造成用戶體驗不佳, 或是用戶繞過ISP既定的路由模式, 自行訪問被封鎖的站點, 情況就如同大陸的網友進行所謂的”翻牆”來訪問Youtube, Facebook等政治敏感的網站. 智財局其實可以積極地對付侵權網站, 尤其是侵犯到我國著作權人經濟利益的網站. 網站的宿主可能是在台灣境內, 可能是境外. 網站使用的網域名稱可能是.tw, 可能是其他如 .com / .net的國際域名, 這些管理單位都有通報機制, 智財局建立起良好的通報和聯繫機制, 讓國內外業者來配合執法, 每年定期出國開會吸取新知新做法, 遠比替自己要到一個封網站落後國家的臭名來的強. Blocking websites is wrong, it is a setback for democracy, and a stupid policy that wastes people's money. Countries which have implemented ISP-level blocking are turning the Internet into an Intranet, the first step for turning a modern country into a self-enclosed country. If the intellectual property bureau wants to implement the policy with an administrative order under the rationale of “blocking copyright infringement by pressuring the ISPs,” it will fall into a trap. […] To request ISPs to block websites according to a blacklist may have some effects in the short run. In the long run, the users will be dissatisfied with their online experience and use circumvention technology to get around ISPs to visit the blocked sites, like what has happened in mainland China, they “jump the Great Firewall” to visit politically sensitive websites such as YouTube and Facebook. There are other measures that could be utilized by the bureau to fight copyright infringement, in particular if the infringement has harmed Taiwanese copyright holders. Every website has to register under a top level domain, the domains can be .tw (local) or .com / .net (international); all of the top level domain registry has a notice system to communicate with government authorities for law enforcement. The IPO should spend more time communicating with the international communities rather than pushing through a notorious policy for ISP-level blocking. Most of the policies or incidents related with IP protection in Taiwan have been dominated by US-related interest groups. You still remember the police shutting down music platform Now.in (an online radio and podcast platform) last year? IFPI is behind the incident. The collateral damage has harmed many independent writers and the Music Copyright Society of Chinese Taipei (MUST) [as Now.in has secured initial consensus with MUST for uploading their music online]. Please tell me who in Taiwan can benefit from this kind of incident? 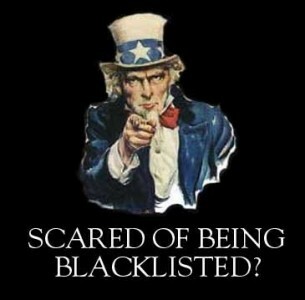 The blacklist for blocking websites at the IP and DNS level cannot be disclosed or else the list would make them more popular. The list will keep updating as the blocked sites will keep changing their DNS. Authoritarian states love these kinds of blacklists which operate in a black box to help them censor the Internet. There is research pointing out that the distribution of pirated copy can enhance the sale of original copy. Even music companies in Taiwan […] now upload their singers MV to YouTube for free consumption (in the past, such kind of sharing was defined as infringement). Last year, PSY's Gangnam Style horse dance became a global hit because of free distribution and consumption online. Although the music company can't take 100 percent of the profit from record sales, it makes a huge amount of profit from PSY's global performance contract and other side products. The free distribution has help the company to extend the market to those countries and regions that cannot be reached before. Concerned citizens have created an event page [zh] on Facebook to gather information and mobilize against the amendment.